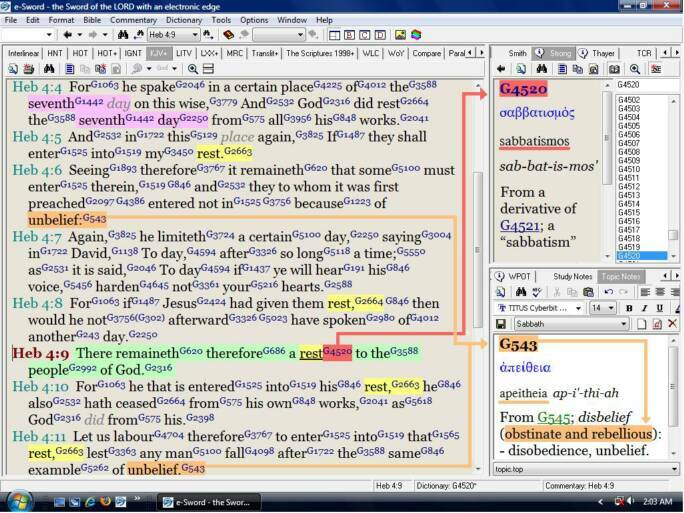 This is an awesome Bible program for PC's that will make your studying of the Scripture so much easier and richer. We've been using it for about 7 years and we don't want to ever go back to only our paper Bibles. We just get so much more information using all the dictionaries. FREE Bibles, Dictionaries, Concordances, & MORE!! But, DON'T read the commentaries. Read the Scriptures for yourself. I always say, "Read the book, don't wait for the movie!" Just ask Yahweh to guide you by His Holy Spirit into an understanding of His words. The dictionaries are a great tool! NOTE: If you would like to have the previous version 8 instead of the new version 9, just email me and we'll mail you a disk that you can install from. There are many more modules available for v.8.06. We take the Scriptural mandate in 2 Timothy 2:15 seriously. "Study to shew thyself approved unto Yahweh, a workman that needeth not to be ashamed, rightly dividing the word of truth." 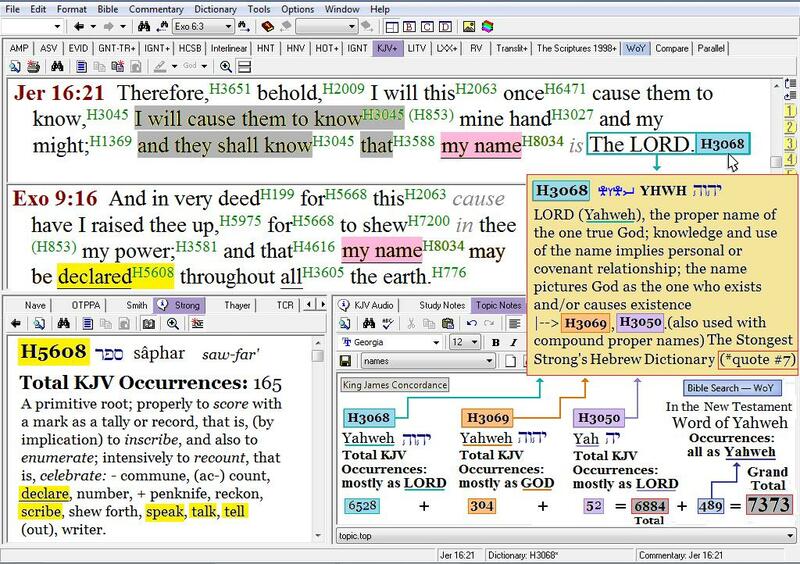 So part of our ministry is to help promote and give away the e-Sword Scripture software package so that you can search the Scriptures to find the truth, rather that relying upon man's interpretation of them. Here are a few screen shots of some studies that can be done with e-Sword. It is amazing what it can do!! obvious from John 1:1 that Yeshua is the Alef Tav, the beginning and the end, as He said in Revelation!! Would you like to have the Strong's Concordance linked to LXX Septuagint in your e-Sword? NOTE: You must rename your existing Strong's concordance file in the C:\Program Files\e-Sword folder from strong.dct to strong.bkp BEFORE installing this one or it will not work! 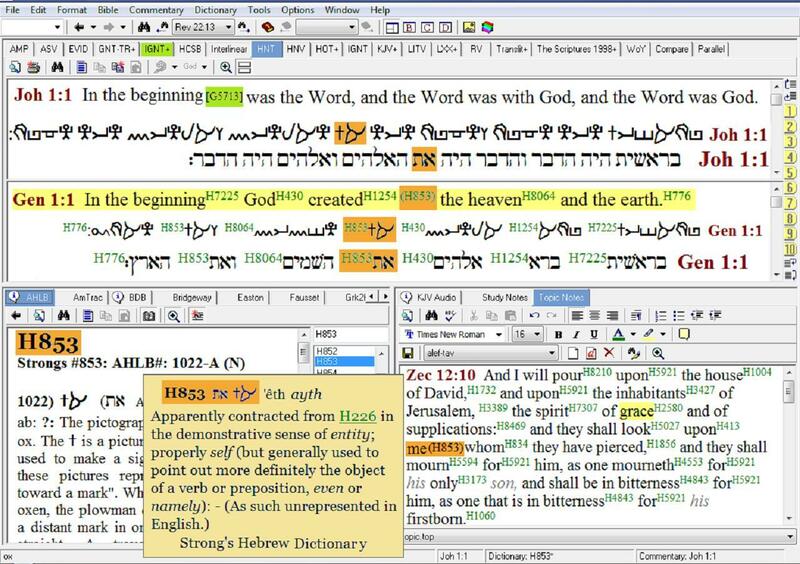 You can create your own parallel Bible from any of the installed translations. DECLARE (scribe, talk, tell, speak, etc.) His name! For more on this study, visit our Names page. The study below about the seventh day Sabbath still being valid in the Brit Chadesha (New Testament)! Hebrews chapter 4 is an awesome chapter. 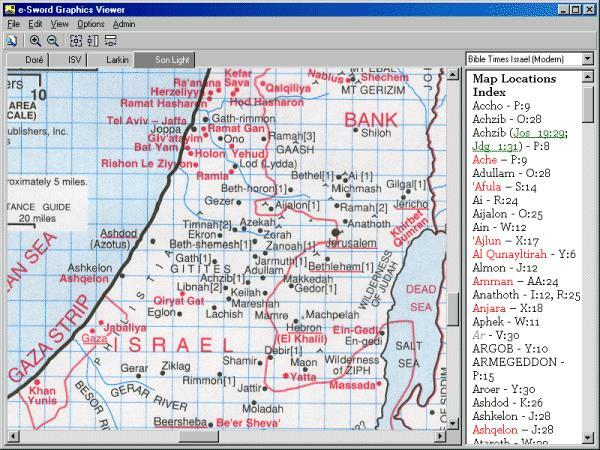 There are many, many maps available and so many resources. It's unbelievable. These instructions are for those who have received an installation DVD. Mark 16 Ministries shares this resource so that you may do as Scripture encourages us all to do in 2 Timothy 2:15. “Study to shew thyself approved unto YHWH, a workman that needeth not to be ashamed, rightly dividing the word of truth.” This resource is shared free, just like all of our other CD’s, DVD’s, books, etc. We believe as Matthew 10:8 says, “Freely you have received, freely give.” We pray this resource will be a blessing to you as much as it has been to us. Below are a couple of things that will help with configuring e-Sword to work correctly. This is a large program with all of the audio files, so please ensure that you have approx. 4 GB of free space on your C: drive before installation. Installation will take 30-40 minutes. Please be patient until the entire process is completed. There will be two separate installations that will run. The first will include all the Bibles, dictionaries, concordances, books, audio files, etc. The second will install the actual e-Sword program from Rick Meyers, the creator of e-Sword. ATTENTION existing users of e-Sword version 9: BEFORE INSTALLATION of this disk, you must uninstall e-Sword version 9, if you want to have access to the modules included on this disk. After uninstalling e-Sword in the Control Panel, go to the C:\Program Files\e-Sword folder or C:\Program Files (x-86)\e-Sword folder and delete any modules with an extension ending in x, for example, all bblx, dctx, cmtx, mapx, notx, topx, etc. Also, go to the My Documents\e-Sword folder and delete any file types ending in x there as well. If you do not uninstall these files, you will get multiple errors when opening this version 8.0.6 e-Sword. Now you can install the e-Sword + audio disk. NOTE TO ALL USERS: Once installation is complete, in order to enable the Strong’s concordance with the LXX related words you must follow the following steps in this order: Go to Computer  C:\Program Files (x-86)\e-Sword folder. Scroll down and find a file named strong.dct. Right click on it and rename to strong.bkp (NOTE: you are renaming the extension only and your system may warn you that the file may become unusable. This is ok.) Then find a file named strong_w_LXX.dct and rename it to strong.dct. ATTENTION: Windows Vista (64-bit only) and all Windows 7 Users: To enable King James audio and Brad Scott audio, go to C:\Program Files (x-86)\e-Sword folder. 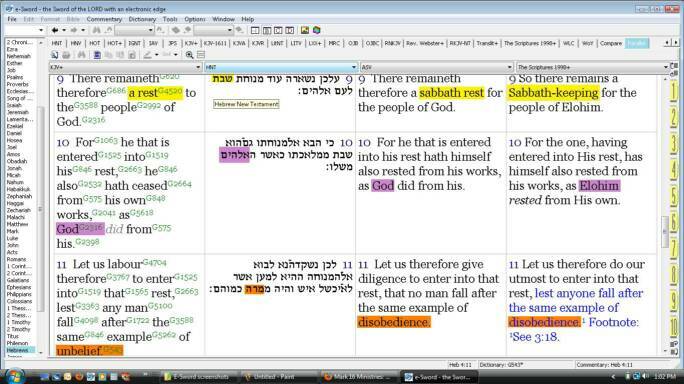 Highlight the KJV Audio and Brad Scott folders, then right click on them and select CUT. Then go to C:\Program Files and create a new folder called e-Sword. Right click this new folder and select PASTE.